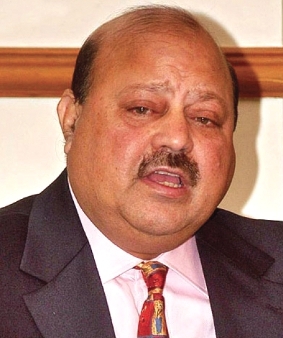 A FORMER Prime Minister of Azad Kashmir has called on Woking people to join a march to raise awareness of the plight of the country. The Million March involves protesters walking from Trafalgar Square to 10 Downing Street on Sunday (October 26). Sultan Mahmood Chaudhry, who was Prime Minister of Kashmir between 1996 and 2001, visited Woking last week to attract supporters as part of a national tour. Mr Chaudhry believes the plight of the Kashmiri people in the Indian military occupied portion needs to be raised at an international level and the United Nations Resolution, dated August 13, 1948, needs to be implemented. The Kashmir issue has been the cause of three wars between Pakistan and India. Tens of thousands of people are expected to march through London to raise awareness of the ‘forgotten millions’ who are suffering under Indian occupation in the region of Kashmir. Sultan Chaudhry is currently on a UK-wide tour visiting towns and cities across the country to muster support in both the Muslim and non-Muslim communities. Tensions are currently running high in the Kashmir region with armed skirmishes reported between the neighbouring and historic enemies – India and Pakistan. But while the two nuclear-armed states continue to wage localised war on each other, millions of innocent Kashmiris are caught in the crossfire. Since 1990, more than 120,000 civilians have been killed in the region. Reports of mass killings, rapes and enforced curfews continue to filter out of the Kashmir Valley as families try to flee the occupied areas. Schools and businesses are being forced to close, bringing the local economy to its knees. Thousands of UK-based residents and businesses still have family and friends trapped in Kashmir and Mr Chaudhry and his Million March campaign team are meeting them in different UK towns every day throughout October – sometimes two or three locations a day – to rally support for the mass march on Sunday. The former PM is also meeting with several British MPs and Euro MPs to enlist their backing and has spoken at the United Nations. Starting in Trafalgar Square at approximately 1.30pm, the marchers, families and friends will be joined by other global humanitarian and human rights groups, making their way to No 10 Downing Street. Mr Chaudhry said: “Imagine Scotland being partitioned into two parts, with one being given independence and the other half occupied by British troops, at a ratio of one soldier for every two civilians, with restrictions on all their movements. “The people of Kashmir have always rejected the idea of having a border separating its people, and have paid a terrible price. We see the disappearance of civilians on a regular basis, only to be found later, tortured and murdered.